Our family has been passionately involved with the meat industry since the 1940s. Mr. Antonio Anselmo, a proud resident of the North Birmingham area, opened his own butcher shop, “Red Front Grocery.” From that day on, the Anselmo family has been committed to providing only the highest quality meats to the Birmingham area - and always with a smile! Antonio's son, George Anselmo Sr. continued the family legacy, and extended the line of butcher shops to include several locations. Spanning from Birmingham, Alabama to Atlanta, Georgia; the Anselmo name and family tradition grew by leaps and bounds. It wasn't long before George's children; Anthony, Rose and George Jr. all had a hand in the meat butchering operation and perfected the craft. 1987 was the year that SRA Foods came into existence. A vision and dream of Anthony Anselmo, SRA started out with one popular item and grew from there. Our Pork Boston Butts were a smash hit in the Birmingham-area BBQ restaurants. Before long, the SRA lineup grew to include beef, pork, and chicken product lines. By 1996, SRA had become an official meat enterprise with our company earning a USDA approval. 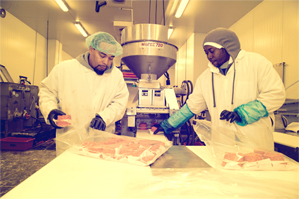 By 2001, SRA gained the ability to expand even further with our opening of a full meat processing facility. Our customers rejoiced at the new products which included custom hamburger patties, portion-controlled steaks, pork chops and chicken cuts - to name a few. Today, the Anselmo tradition of quality meats has come to full fruition, with the SRA product line including over 1000 distinct items. Southeastern US restaurant and BBQ patrons are ordering, enjoying, and asking for seconds of SRA meat products, every day. Our quality provisions can be found everywhere from quick service restaurants to the tables of James Beard award-winning chefs. Since SRA came about in 1987, every customer served has been reminded at the conclusion of their calls with our representatives that they have, "A Friend in the Meat Business." Why don't you become our friend, too? Enjoy a plate of SRA meats and you'll feel like family!